Below is a small selection of student work, which I believe is emblematic of my expectations in terms of critical thinking, creativity, and academic writing. Unless otherwise indicated, all are final drafts that were honed after significant formative assessment and feedback. Visitors can also view some of the current my work students have in progress by returning to the home page, selecting a course at the bottom, and then selecting students' blogs in the blog roll on the right hand column of the course page. Students were given total freedom within the context of the course to choose topics of interest to them and to work on creating whatever products they thought would best build the skills they wanted to work on. They were guided in developing clear, focused, and complex research questions, given guidance as to credibility and authoritativeness of sources, and then set free to inquire on their own. 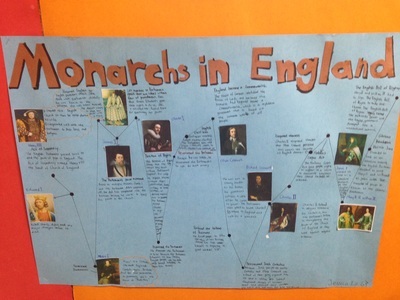 They received very detailed feedback on a project outline, their first draft, and ultimately, their final. As always, they self-assessed at each stage as well. I was extremely pleased with their work! 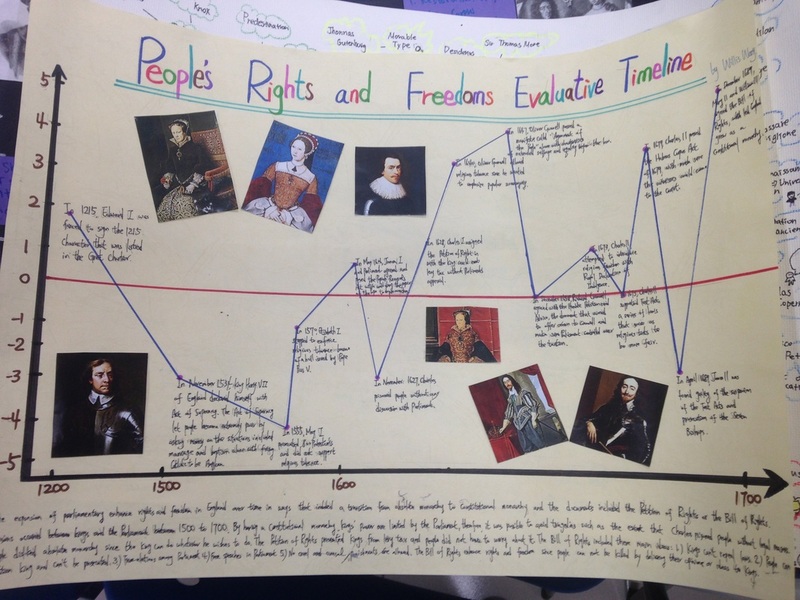 For this summative assessment, students developed their own Essential Questions, conducted historical research using at at least two primary and two secondary sources, and had to demonstrate their learning by making a video to teach an authentic audience about their topic. The examples below are by no means flawless in terms of content delivery, but are a great first attempt creating a product of this kind. Students were tasked with peer and self-assessing the projects, which included identifying and explaining errors found within them. For this project, students had to critically evaluate what they determined to be the 10-15 most important events in the development of constitutional monarchy in England. 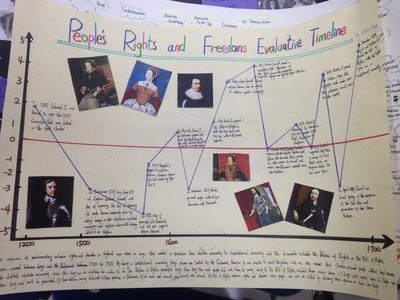 Using a +/- 5-point scale, they ranked the events in relation to each other, thereby visually representing the relative degree to which particular events expanded or curtailed rights for particular groups. 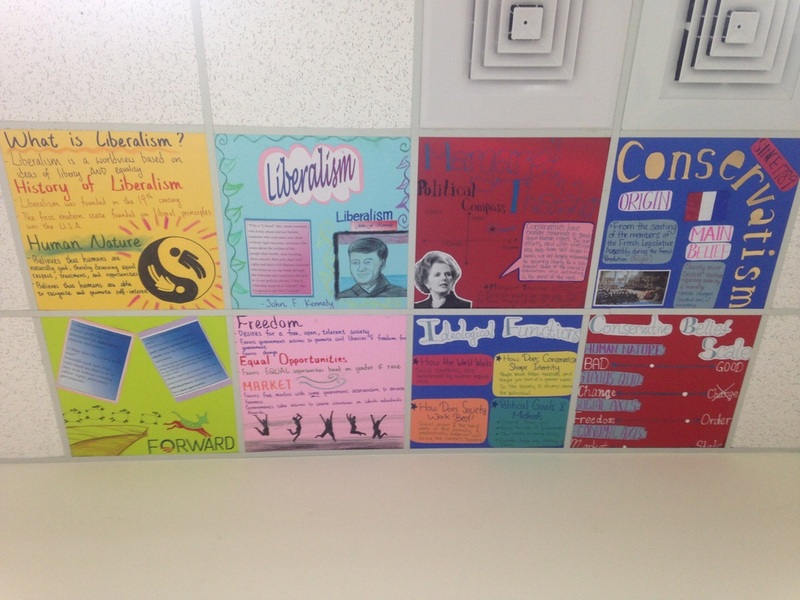 This project provided students with an opportunity to demonstrate their understanding of civil liberties in the United States. They were asked to create a product that other students could use in the future after arriving as college students in the United States. 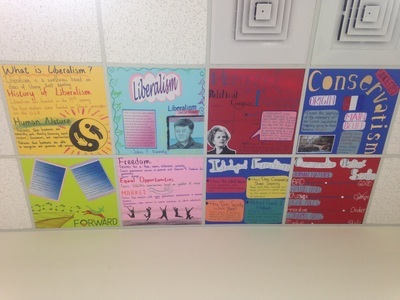 This project required students to research the different policy platforms and political strategies of opposing protest movements, Occupy Wall Street and the Tea Party. They then created podcasts that demonstrated understanding of the fundamental similarities and differences in political ideology and explain what each movement could have learned from the other in terms of achieving its goals through the political process. For this essay, students were asked to view assigned videos and articles presenting contrasting perspectives on the effects of the Citizen's United Supreme Court ruling on the American democratic process. They were expected to produce an evidence-based essay that compares and contrasts and critically evaluates the authors' arguments, and answers the Essential Question, Does Citizen's United threaten democracy? In order to apply their conceptual understandings about the causes of terrorism and the types of conflicts taxonomy, students were tasked with researching and reporting on ISIS. My grade 10-11 IR students worked extremely hard to wrap their heads around the complex confluence of factors that gave rise to the financial crisis, which the Academy Award-winning documentary, Inside Job, helped everyone to understand. 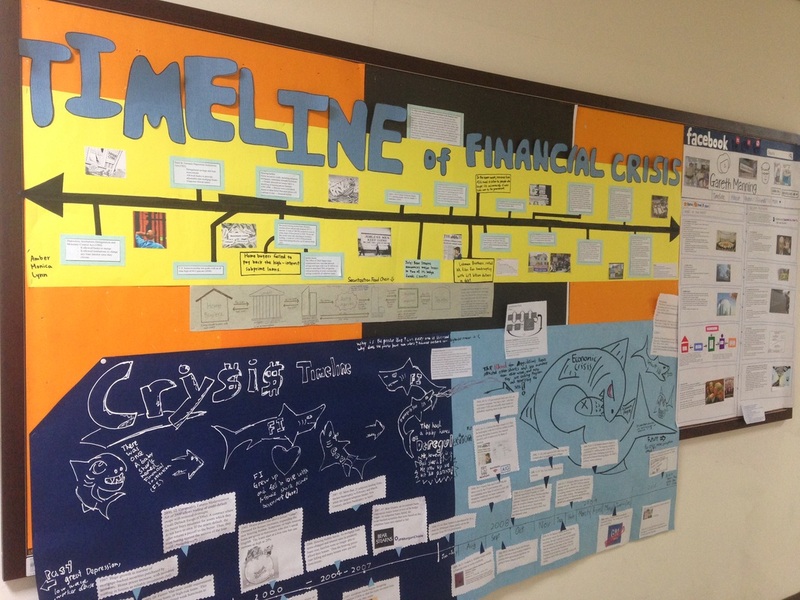 One of their performance assessments was the creation of a timeline of the crisis, explaining the key events and answering the Essential Question, To what extent was the 2007-08 financial crisis a result of neoliberalism? One group chose to do it in the format of a Facebook page of my life, which is hilarious. All of these were awesome and I'm still really proud of my IR students! For this paper, students were asked to conduct research on the issue of what causes global poverty, to reflect on their own privilege, and decide whether they would become activists or bystanders in the fight to alleviate global poverty in the future. For this relatively simple project, students had to design posters to demonstrate their understanding of the core features of a particular ideology using political science categories of analysis. Designed to replace ceiling tiles, they made our room look a little more colorful, but due to the hassle of replacing tiles and the incredible mess it ends up making as the original tiles inevitably start to disintegrate, we probably will not be doing something like this again. It was cool while it lasted, though! 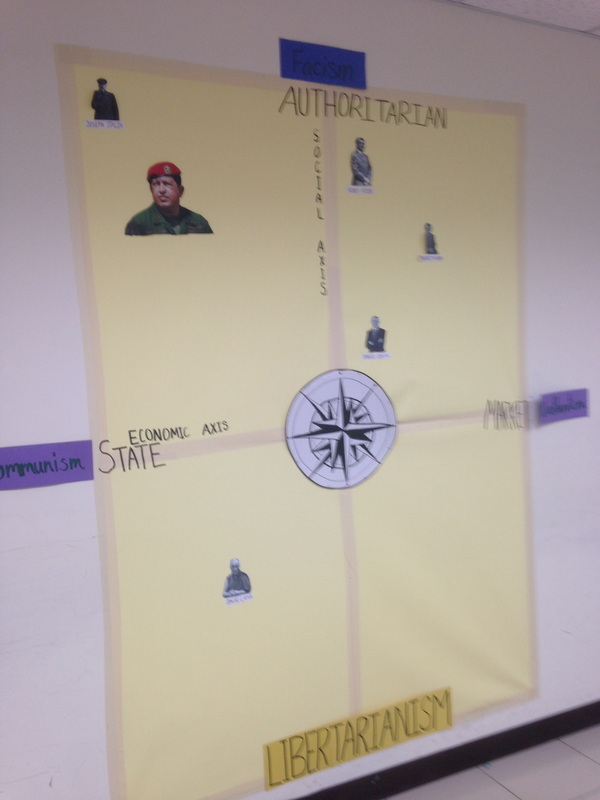 This was a really useful tool that we developed throughout the year (unfortunately, this pic is a bit fuzzy and was taken right after beginning the project... I forgot to take one at the end!). 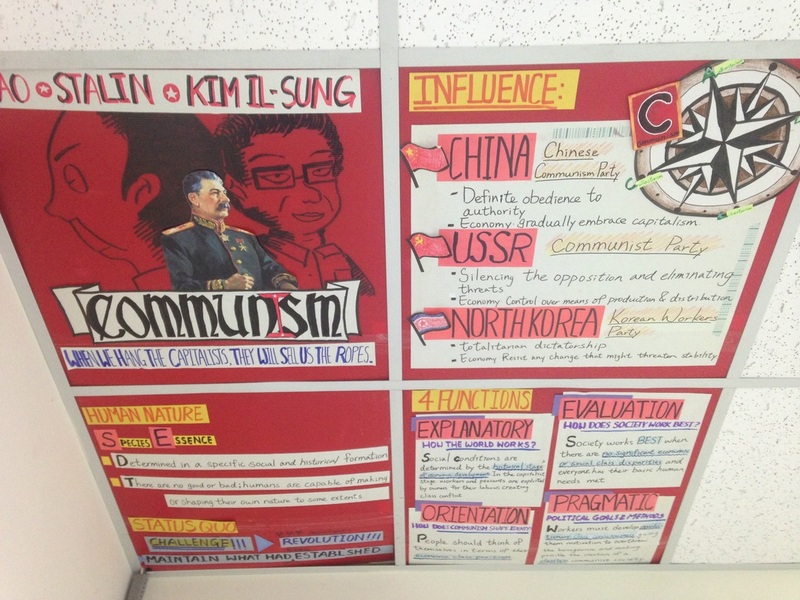 It allowed us to think critically about how different leaders of states we were examining differed in terms of their social and economic policies. An imperfect explanatory tool to be sure, but a great way for us to think deeply about policy differences and their ideological and pragmatic foundations.